Surgery of whatever nature has risks attached to it. It is necessary to weigh the risks of surgery and compare them against the benefits, especially if the procedure is not medically vital. For example, laser refractive surgery is a surgery that an individual chooses to undergo to usually improve his level of life rather than to prevent death. Therefore, as long as the patient is not forced into having surgery, he should find out as much as possible about the risks associated with the future procedure. Both LASIK and PRK are eye corrective procedures that make use of a laser to shape a person’s cornea, resulting in improved vision. LASIK surgery involves the creation of a thin flap that helps treat the corneal tissue. On the other hand, the procedure behind PRK does not involve the use of a flap. PRK may cause some discomfort and bring a blurry effect, though this is only temporary as the eye heals. The two eye corrective surgeries are highly effective although they cause dryness in the eye and at times, the patients may end up needing glasses. On reaching 40, most of these patients end up needing glasses even after achieving 20/20 vision. Just like any other surgical procedure, complications may arise if a professional did not conduct the surgery or if the patient did not follow the instructions carefully. In the event that the crystalline lens becomes cloudy, hampering clear vision, cataract surgery is the best way out. Cataracts are of different types, and the most common type includes the age-related cataracts. Cataracts develop because of several factors, the most common one being exposure to sunlight over one’s lifetime. The cataracts develop over a long time and this leads to doctors monitoring the condition and recommending surgery when they reach poor levels of vision. Endophthalmitis is the most significant cataract risk, which, if not taken care of, may lead to eye infection. Anti-inflammatory and antibiotic eye drops are used together with superior surgical techniques to keep the risk of infection to a minimum. In spite of having cataract surgery, eye disorders can still occur and may lead the patient to need glasses in the future. Other eye disorders require the use of specialized surgical procedures. For example, if an individual is suffering from corneal irregularities and the cornea needs surgical transplanting, that calls for a specialised procedure. Endophthalmitis and graft rejection are risks that a patient faces in case they undergo a corneal transplant. 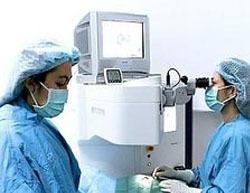 Although the improvement in technology has brought about new techniques that make surgery much safer, a patient is still at risk of a reduced visual quality. Retinal surgery replaces the thin retinal tissue, therefore it is a procedure that is very complex. This surgery involves either laser treatment, injecting a glass bulb into the eye, and other intraocular procedures. Just like in other procedures, the patient is at risk of infection and in serious cases, damage to the retina. One procedure used to reduce the intraocular pressure in the eye is glaucoma surgery, whose function is to reduce the size of the eye. Like most other procedures, the patient is at risk of infection. These surgeries emerge when doctors realise that the condition is placing the patient’s eye at huge risk.